Facebook is now officially in the payments game. Rather than partnering with another player such as PayPal or Square, in the same approach that Snapchat took with Snapcash in November, Facebook has decided to build their own systems. This is another example of financial technology continuing to go mainstream. Maybe now it will be "cool" to do a FinTech startup? When you chat with friends about settling debts or splitting the bill, Facebook doesn’t want you to have to open another app like PayPal or Venmo to send them money. So today it unveiled a new payments feature for Facebook Messenger that lets you connect your Visa or Mastercard debit card and tap a “$” button to send friends money on iOS, Android, and desktop with zero fees. 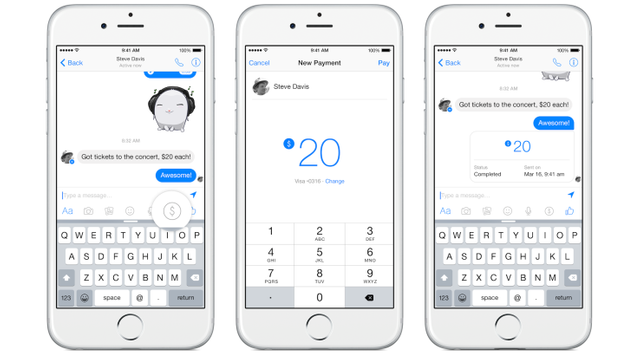 Facebook Messenger payments will roll out first in the U.S. over the coming months.